The Titanic Experience, the world’s largest Titanic exhibition, was opened to the public on the 31st of March 2012 to commemorate one hundred years since the loss of the RMS Titanic. Forecast to attract in the region of 400,000 visits per annum, the iconic building has been set up as the cornerstone of the Titanic Quarter; Europe’s largest urban regeneration project. The building housing The Titanic Experience is situated on the Harland and Wolff slipway where the ocean liner was first created. The interior holds over 2,000m² of floor space and is composed of nine galleries which host a number of innovative, interactive and immersive experiences. These allow visitors to understand and explore the story of the Titanic; from its design and construction, through to the infamous maiden voyage and on to the current undersea wreck exploration. 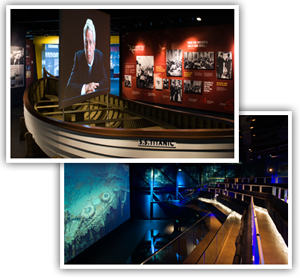 Executing this immersion seamlessly within each gallery could not be achieved without reliable technology; particularly projectors and lenses which are integral in the creation of the ‘Boomtown Belfast’, ‘The Fit-out’, ‘The Sinking’, ‘Myths and Legends’ and ‘Titanic Beneath’ galleries. The entire technology system was designed, programmed and installed by DJ Willrich; an Audio Visual and Multimedia Specialist with over 20 years experience. DJW provide bespoke and entirely turnkey solutions which focus on meeting the needs of each client. Having worked on projects world-wide, they are well versed in dealing with different cultures and practices and entirely aware of the need to design reliable, easily maintainable systems. DJ Willrich selected over 60 Panasonic projectors and lenses to be used within the project, including the DZ110X, DZ6700, DX500 and D5000 projectors and DLE080 lenses. The PT-DZ110X 3-chip DLP projector is known for bringing together high brightness, picture quality, reliability and full HD readiness into a sleek, compact design. For continuity and reliability 24/7 projection is enabled through a Dual lamp system making the design ideal for a popular exhibition such as the Titanic Experience. The ‘Titanic Beneath’ gallery used one of the five DZ110X’s featured against a 12-metre wide screen, giving viewers the sensation of flying over the wreck in a submersible. This then morphs into a bird’s eye view of the wreck of the Titanic which was achieved using multiple video projectors, projecting down into the pit and soft edge blended using the in-built projector processing. The PT-DZ6700, PT-DX500 and PT-D5000 used within the exhibition form part of Panasonic industry-leading 1-chip series which incorporate a wealth of unique proprietary technologies, to bring high-quality images to a variety of operating conditions and applications. The DZ6700 offers brighter and more vivid images than ever before. With 6000 lumens of brightness, WUXGA resolution, and Panasonic specialist RGB Booster technology for high brightness, and superb colour reproduction, a host of technologies work faultlessly together for realistic, lifelike images. Additionally, a Dual-Lamp System, and Auto Cleaning Filter (ACF) extend operating stability and contribute to reliability, allowing for continuous 24/7 projection. The DX5000 is compact and affordable with a dust-resistant design. It delivers 4,500 lumens of brightness, boasts a high contrast ratio of 2,000:1 and features Daylight View Premium technology for optimal colour perception. With newly engineered RGB Booster technology, Detail Clarity Processor for further depth and clarity, and 360° angle setting, it’s clear to see that every feature of the PT-DW530E has been designed and developed with performance and flexibility in mind. Loaded with a wealth of unique technologies and bringing natural, lifelike colours to images the D5000 projectors are used in conjunction with short throw zoom lenses enabling their positioning in very close proximity to the screen and high in the ceiling with an extreme offset. 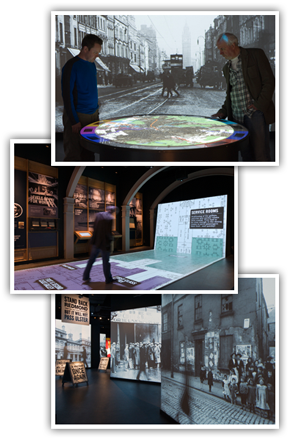 This is the case in the ‘Boomtown Belfast’ gallery where street scenes are projected and visitors’ shadows became part of the display. Other features include a developed RGB Booster technology which combines superb colour reproduction with high brightness – even in brightly-lit rooms, a Dual Lamp system for solid reliability, and Auto Cleaning Filter (ACF) eliminating the need for filter maintenance for approximately 10,000 hours. Additionally, System Daylight View 2 a unique Panasonic technology that optimises image quality to improve the color perception of the projected image in brightly lit rooms.